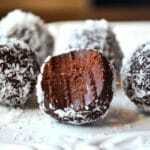 Dark chocolate avocado truffles for an intense chocolate hit minus the guilt. Melt the chcolate in a heatproof bowl above some simmering water ( do not let the bowl touch the water and turn off the heat when it come to a boil ) along with the honey, vanilla extract and salt. Spoon out the avocado flesh from it's skin and place in a food processor. Let the chocolate cool slightly then add the chocolate mixture and blitz until comletely smooth and thickened. Place the mixture in the fridge to solidfy a little more for 15-20 minutes. Once out the fridge, roll into little bowls using a teaspoon as measurement and place onto a plate or tray covered in baking parchment. Once you have your truffles, roll them in some desicated coconut or nuts or your choice ( I really like chopped hazelnuts ). Enjoy at room tempeture and store in the fridge.